Well, on the most basic level, our survival as a species depends on it. Nothing, not even the Earth, will last forever. If in the course of a few billion years we do not destroy our civilization through war or make our one and only home in the universe uninhabitable through uncontrolled population growth, resource depletion, global pollution, or any combination of the above, our life-giving Sun will evolve into a world-devouring monster that will, without question, destroy Earth's potential to support life, if not the planet itself. In time, the Sun will expand, destroying the Earth in the process. Like people, stars are born, mature into 'adulthood,' grow old, and die. The glowing clouds of nebular gasses that so enchant modern astronomers and astrophotographers are, in reality, stellar corpses, the remains of stars that have died after using up all of the fuel that kept them shining brightly for millions, perhaps billions of years. When a star is in the prime of life, it fuses hydrogen atoms into helium, releasing untold amounts of energy the equivalent of billions of thermonuclear explosions a second. Why does the star then not blow itself up? Gravity. While the force of the nuclear fusion seeks to push out a star and make it expand, the star's own gigantic mass produces a gravitational force that keeps the star in a state of equilibrium between these two, competing forces. A star begins to die when it uses up all of its hydrogen fuel. The nuclear fusion stopped but gravity still going strong, the star contracts into itself thanks to gravity. However, as the star contracts, it heats up to the point where it can start fusing helium nuclei together, releasing far more energy than it would with hydrogen fusion. Result: the extreme amount of energy released by the helium fusion somewhat overcomes the force of gravity, thus causing the star to swell to several times its original size, its outer atmosphere cooling as it expands. So, despite its growth in size to the red giant phase, the star is living on borrowed time as it will continue the cycle of burning an element, contracting, fusing an even heavier element, expanding, and so-on until iron is the next material in line for fusion. Unfortunately, iron fusion cannot occur because it takes more energy to fuse the nuclei than the fusion itself will generate. Result: fusion stops and the star dies. In the case of the Sun, the Earth will have long since been engulfed by the swollen star itself by the time fusion stops. However, the Sun need not engulf Earth to destroy its life-giving potential. As the Sun expands, all the water will evaporate, the planet will heat up, and eventually the atmosphere will dissipate, leaving a hot, irradiated world inhospitable to life. So, if we are to survive as a species, we must journey back to the stars from which we came, hence the importance of space exploration. Now, some may be saying “that's billions of years from now, so why worry about that now?” My response? In all likelihood, we don't have billions of years to ponder our fate. Right now, the Earth itself is at a precarious point in its history. The Industrial Revolution, a common study in history books in the Western world, is an in-progress event in much of the so-called “Third World.” Right now, the world's two most populous countries, China and India, are on an incredible rise to industry in an unbelievable rate. Result: these emerging world economies are polluting themselves as they modernize, supposedly for the better. Right now, China and Indian urban areas are among the most polluted on Earth. In fact, it's a wonder that Beijing got the Olympic Summer Games in 2008, considering its horrid air quality, which it managed to improve, at least temporarily, for the Games. Now, while the pollution may be somewhat nationalized (at least at this point), the demand for energy is a worldwide problem. The Industrial Revolution was built on fossil fuels: first coal, then oil, and finally gas. Right now, all three fuels are being utilized to drive the world economy at an ever faster pace. Problem: as more countries modernize, more sources of energy will have to be found as, right now, we face the probable depletion of both oil and natural gas within our lifetimes if more sources are not found. Coal, the dirtiest of the fossil fuels, will hold out longer with current reserves. Obviously, when the world's energy sources are depleted, the world economy will grind to a halt and our very way of life will be changed irreversibility. In a way, the planet itself will be used up. We need not have to wait for the Sun to turn into a monster in order to destroy our world. We're doing a “good” job of that already, which creates a more pressing need to journey to space. The old adage goes that those who fail to learn from history are doomed to repeat it. One way or the other, we will be forced to leave our current home, the Earth, at some point in the future. Hopefully, by the time that event comes, we will have sufficiently learned enough from our history to do better on our second try at establishing a home, whether it be on a spaceship or on another planet. However, why should we have to wait for our current world to fail us before we start to correct our erroneous ways? By journeying into space, we are immediately forced to confront many issues that Earth-bound leaders are desperately trying to put off for the time being. Those shiny metal panels aren't for decoration! First up: sustainable use of energy and resources. There are no fossil fuels in the cosmic expanse that is space. Result: we must learn to live self-sufficiently. 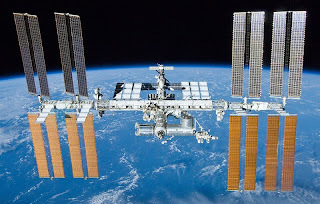 On the current International Space Station as well as the past Mir and Skylab, power has come from a very practical, yet often ignored on Earth source: the Sun itself. Thanks to today's high technology, sunlight offers more potential than ever to be converted into other forms of energy, as is currently being done on the International Space Station. The best part about solar energy is that, at least in some areas, it is limitless, virtually free after the initial investment, and creates no pollution, either. In short, lessons on efficient use of energy learned in space can be used to improve life on Earth. Second: food production. Right now, Earth is on an unsustainable path when it comes to an expanding population. Until the Industrial Revolution came about in the 1800s, world population growth was a very linear, slow process. However, since the boom of industry, population expansion has gone from arithmatic to geometric. One of the first men to warn of such unchecked growth was Thomas Malthus. In his writings, Malthus warned that, should humans fail to take the necessary steps to voluntarily curb population growth, outside checks in the forms of famine, disease, and war would do it for us. However, more often than not, the warnings of Malthus were ignored in favor of optimistic visions of the future wherein improved technology would solve food production problems. So far, the technology has, by and large, averted the catastrophes predicted by Malthus. However, while technology may be winning the race today, who's to say what will happen in the future? So, with the prospect of technology failing at a point, what better time than now to explore alternate methods of food production in space? 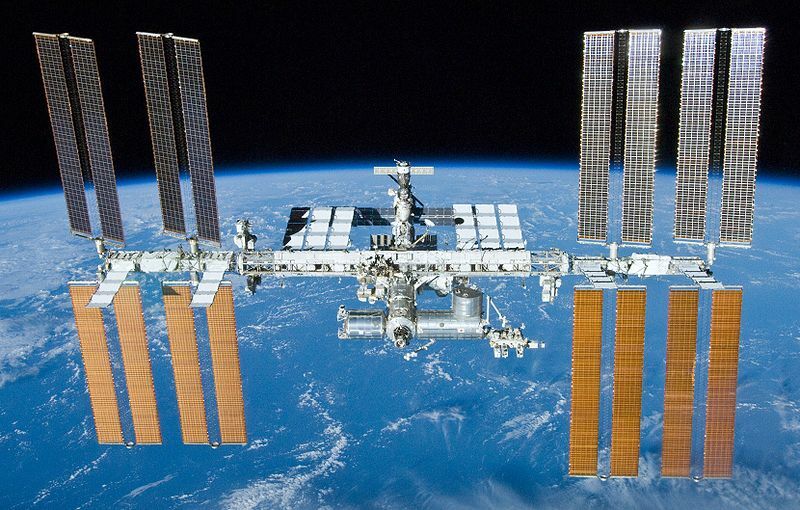 Right now, hydroponic gardens are nothing new, so why not try them in large scale on the ISS? Think about it, if new, efficient techniques of food production could be developed in space, they could be transferred to Earth where they could be applied in places that would otherwise be unsuitable for farming. Such as the roofs of big city highrise buildings. So, besides observation decks and communication towers on the top of skyscrapers, why not greenhouse gardens? Earth from space: can you see the national borders? A third lesson learned from space exploration already proving fruitful is international cooperation. It's funny how national boundaries disappear when the Earth is viewed from hundreds of miles (or hundreds of thousands of miles in the case of the Moon) up in against the blackness of interstellar space. Only from this perspective can we humans realize that we live on what amounts to a tiny island in the vastness of an infinite, inhospitable sea that is the universe. Like it or not, we're all in the endeavor called global civilization together and, thanks to weapons of mass destruction, we are now a species that has the potential to, through a few rash actions, destroy not only our high civilization but also all life on our planet itself. By looking at our history, this is as very real possibility. For over 50 years, the world was held hostage in a Cold War between the United States and the Soviet Union, each nation promising to destroy the other in the case of nuclear attack. Ironically, the doctrine of mutually assured destruction can be acronymed as MAD. Now, with the collapse of the Soviet Union and the advent of nuclear proliferation, these same weapons can fall into the hands of rogue nations and terrorists, neither of which would likely hesitate to use them against perceived “enemies.” Even more frightening is the prospect of germ warfare unleashed by a rogue nation or terrorist group. Unlike nuclear weapons, a germ holocaust would not be difficult to unleash. Take a tiny amount of a super germ, release it in a major city with airports, and, in the course of a few hours, simultaneous outbreaks all over the world could turn into a global pandemic before science could have a chance to mobilize a counter attack to try and halt the spread of disease. In stark contrast, international relations in space have been very productive. By looking at the videos of the Apollo-Soyuz mission of 1975, one would forget that the two sponsoring nations were enemies on Earth when there was such harmony in space. In the intervening years, the tradition of Apollo-Soyuz has continued with Earthly concerns seemingly forgotten when astronauts of different nations are put together as partners in a common endeavor hundreds of miles above the conflict on Earth. Needless to say, we on Earth could learn a lot from our fellow humans in space to make life on our home planet better for all. Looking back at scientific literature of the 1960s, it is not hard to see why so many writers believed that we humans would be living on massive cities in space and colonizing other worlds come the turn of the millennium.. At the start of 1957, humans had yet to launch anything into space. 10 years later, NASA was drawing up its final plans for landing a man on the Moon. Think about it: in 10 years, humans had gone from being an Earth-only species to one on the cusp of journeying to another world. So, when the present was the 60s, it seemed every bit feasible that such quick advancements would continue far into the future. So, were did we go wrong? Answer: the political climate changed. 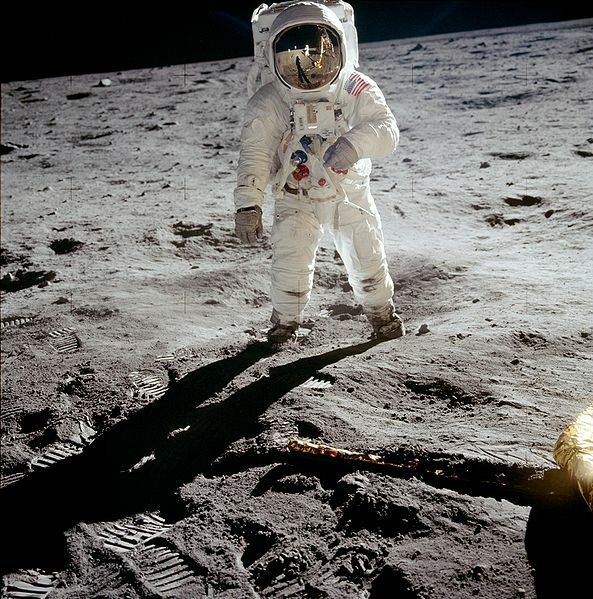 In 1961, president John F. Kennedy famously declared that America would land a man on the Moon and return him to Earth before the end of the decade. While that may have been just talk in another time, before or after, in the 1960s, it was serious business as the Cold War was on the verge of becoming a hot one. While coming about with neutral aims, rocketry quickly became a military science. By the 1950s and the advent of nuclear weapons, the capabilities of a given nation's rockets was a symbol of that country's power. The longer the rockets could fly, the greater the capability of delivering atomic death over vast distances. When the USSR launched Sputnik into orbit in 1957, it was obvious that Soviet rocketry was ahead of American capabilities. Theoretically, with rockets capable of launching payloads into orbit, the Soviets could rain death from the heavens of any city in the world. So, in order to keep the balance of power eve, American scientists had to work fast to equal their Soviet rivals. And they did. However, after the end of the Space Race, which America won by landing Apollo 11 on the Moon, the desire to compete subsided to the point that, by the mid 70s, Americans and Russians would cooperate on the first international space mission. Another reason that the quest to explore space faltered was this: money. In 1961 when President Kennedy made his famous pledge, the economy was on the upswing, a trend that would continue through 1966. However, even as the first Apollo rockets were lifting off into space, there was trouble below. By the late 60s, the cost of President Johnson's Great Society welfare programs and the Vietnam War were combining to overburden even America's economy. By the end of the decade, America was into a recession that would last, with small rises but many more plunges, into the 1980s. Simply put, the money as well as the public's appetite for space exploration (remember, we won the Space race with Apollo 11) dried up. In short, these two factors conspired to end the rapid ascension of space science and, without the impetus of the Space Race, the money that launched us into space was diverted elsewhere, the technology was left to stagnate, and the science itself was deemed an unworthy reason to explore space. Result: over 40 years after the first Moon landing, America is incapable of repeating the feat despite the wondrous advances in technology that have been made since 1969, a truly inexcusable blunder, one of the great mistakes in history that, to a lesser degree, parallels Europe's descent into the 1,000 year Dark Ages after reaching the pinnacle of achievement that was the classical Greco-Roman civilization. Now, just like scientists of the Renaissance, we are forced to reinvent what was a mastered technology in the past, probably spending far more money than would have been spent by continuing the Apollo Program and shifting the focus to permanent Moon bases. To survive as a species, man must explore space and governments must find the funds to pursue this life-preserving undertaking. Yes, while the Sun may have a lifetime of about 10 billion years and thus, probably another 2 to 3 billion years of stability during which life on Earth can continue to exist without feeling the heat, chances are that we humans will use up our planet before then, thus necessitating a much earlier move into space. So, instead of pretending that the looming crisis doesn't exist, we as a species must confront the problems now by developing the capabilities to live in space in the future and perhaps improving life on Earth at the same time, too. If we are to survive, we must embrace our destiny as a space-faring civilization, the sooner the better.